The first in a series of Limited Editions, this set of 5 art quality greeting cards features 5 original drawings in ink and colored pencil by spiritual teacher, poet, artist, geek and pop culture connoisseur Dzogchen Ponlop. 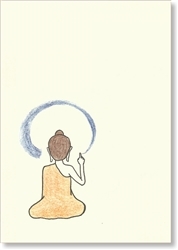 Each drawing evokes a different aspect of Buddha Shakyamuni’s compassionate wisdom, and inside every card is a quote from Dzogchen Ponlop's Rebel Buddha: A Guide to a Revolution of Mind. Offered in 5” x 7” size, suitable for framing.